I recently upgraded a VSAN cluster to ESXi 6.0u2 and was interested in enabling the new VSAN Performance service. I also had a net-new cluster to install. The storage policy is blank and you cannot click OK. 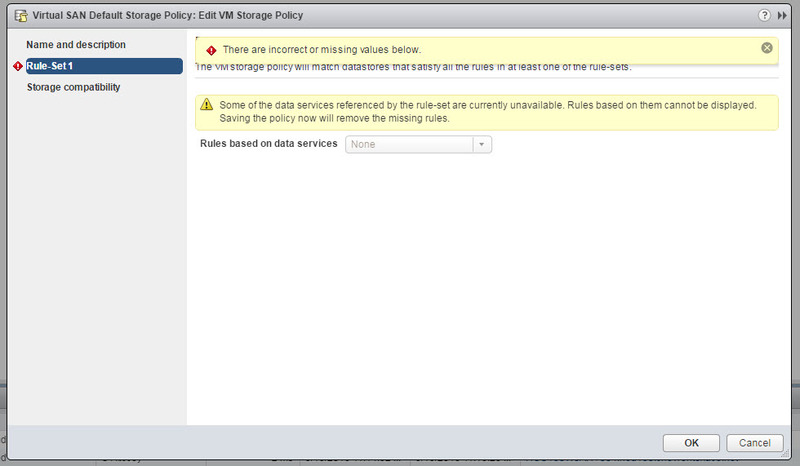 The thing to look at is “Some of the data service referenced by the rule-set are currently unavailable”. For my upgraded cluster I didn’t see the VSAN Providers show up in the list. For my net-new cluster it was disconnected (note these clusters are different vCenters). For my upgraded cluster, I clicked the rescan button and it found my VSAN Providers. From that point I could enable the performance service. For my net-new cluster, I had to a bit more work. It turned out that my issue was certificate related based on this KB. Open a command prompt in Windows vCenter server. 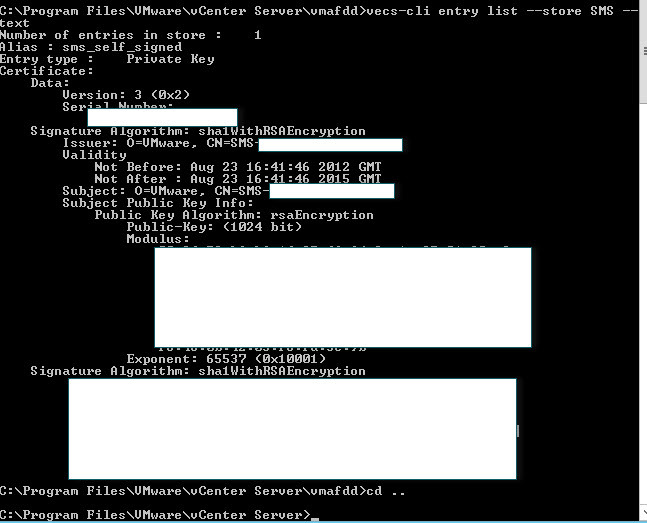 Navigate to C:\Program Files\VMware\vCenter Server\vmafdd. Restart VMware vSphere Profile-Driven Storage Service and VMware vSphere Web Client to re-generate the SMS certificate store. In the vSphere Web Client, navigate to vCenter Server > Manage > Storage Providers. Right-click on each VSAN Storage Provider (each ESXi host) and click Resynchronize. In the vSphere Web Client, navigate to vCenter Server > Manage > Storage Providers. Right-click on each VSAN Storage Provider (each ESXi host) and click Resynchronize. After I completed these steps, I could enable the performance service and provision VMs. Excellent. Fixed my issue perfectly.